In the early 1980s, tens of thousands of Cambodian refugees fled their war-torn country to take up residence in the United States, where they quickly became one of the most troubled and least studied immigrant groups. This book is the story of that passage, and of the efforts of Khmer Americans to recreate the fabric of culture and identity in the aftermath of the Khmer holocaust. Based on long-term research among Cambodians residing in metropolitan Boston, this rich ethnography provides a vivid portrait of the challenges facing Khmer American culture as seen from the perspective of elders attempting to preserve Khmer Buddhism in a deeply unfamiliar world. The study highlights the tensions and ambivalences of Khmer socialization, with particular emphasis on Khmer conceptions of personhood, morality, and sexuality. 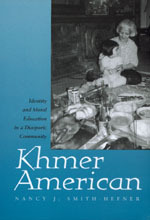 Nancy J. Smith-Hefner considers how this cultural heritage influences the performance of Khmer children in American schools and, ultimately, determines Khmer engagement with American culture. Nancy J. Smith-Hefner is Associate Professor of Applied Linguistics, University of Massachusetts at Boston.